A seventeen year old Winnipeg boy died after being tasered by police last Tuesday. Michael Langan is the 22nd person since 2003 to die in Canada after being tasered by police and we can expect a 23rd, 24th and 25th death any day now. What should be a last resort for police is clearly becoming a popular choice for dealing with anyone they deem the least bit problematic. Take the November case of a sixteen year old Manitoba girl who was tasered on her legs and groin area while confined to an RCMP holding cell as four officers held her down; if police are so ready to use tasers in a situation where the numbers and circumstance are obviously in their favour, we can expect them to show still less restraint in more complex or risky scenarios. “Statistics prepared by RCMP officers show that Mounties drew or threatened to draw their Tasers more than 1,400 times in 2007, up from 597 in 2005.” That's one hell of an increase and the taser is one hell of a crutch to lean on—up to 50,000 volts of electricity jolting its target (aka the human body), which as of May had resulted in 290 deaths in North America since 2001. 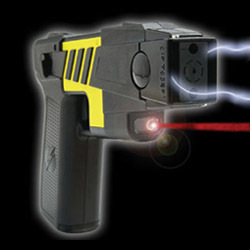 Across Canada, 73 law enforcement agencies use stun guns. The RCMP currently have 2,800 tasers which 9,100 officers are trained to use. The Manitoba girl mentioned above, now seventeen, admits she fought back against the police the night she was arrested but if the best solution officers can come up with every time they meet the slightest bit of force is to reach for a taser seventeen year old boys and girls (and let's not forget you, me and grandma!) across the country are in danger from a weapon that officially isn't being considered potentially lethal.